derailed near Kalka this afternoon, a senior railway official said. News channels said that the two deceased persons were foreign nationals. "The accident occurred when the train was about 3.5km away from Kalka. The accident site falls in Himachal Pradesh. "Preliminary reports received from the site said that two persons have died in the accident while at least five others are injured," Divisional Railway Manager, Northern Railways, Ambala, Dinesh Kumar, told PTI over the phone. He said that the chartered train, with four bogies, had been hired by tourists. It met with the accident on the Kalka-Shimla rail tracks. "The special train was booked through an agent," he said. Kumar said the cause of the accident was not immediately clear and an inquiry had been ordered into the incident. "One full coach derailed while another derailed partially. A railway team has already reached the site. Immediate relief was provided to the injured and arrangements were made to shift them to a nearby hospital. The railways also provided ambulances and other necessary assistance," he said. 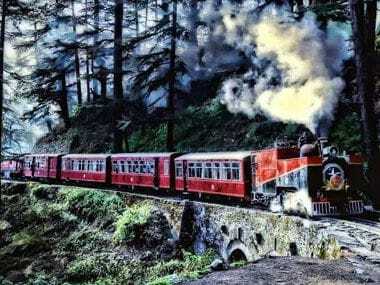 The Kalka–Shimla Railway is a narrow gauge service which mainly covers the mountainous route from Kalka to Shimla.